Vancouver’s Main Street runs southbound from Gastown and the Downtown Eastside through Chinatown. To locate the Mount Pleasant, continue past the SkyTrain and Pacific Central Station to the core of the neighborhood at Main and Broadway. 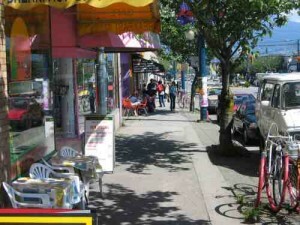 The SoMa (South Main) district of Mount Pleasant is a mecca of fashion, art, and design boutiques, as well as a diverse and affordable area for groceries, restaurants, and cafes. This is Vancouver’s go-to-place for local artists and designers. One-of-a-kind fashion, handmade crafts and accessories are available in countless boutiques throughout the neighborhood. Family-run eateries can be found alongside upscale restaurants. Dining in? KIA Foods is a small, health-oriented grocery offering a number of bulk food and specialty items as well as basic produce, meats, cheeses, and dry foods (2600 Main Street; Vancouver, 604-872-4413). For a range of more standard options, try IGA Marketplace, a large chain-food store with a full bakery and deli (2949 Main Street; Vancouver, 604-873-8377). Brewery Creek Cold Beer and Wine Store features a diverse selection of beers, wines, and some liquor (3045 Main Street; 604-872-3373). The award-winning Aurora Bistro is an intimate, upscale establishment with a basic but modern West coast inspired menu and an interior space to match (2420 Main Street; Vancouver, 604-873-9944). Looking for something a little bit spicy? 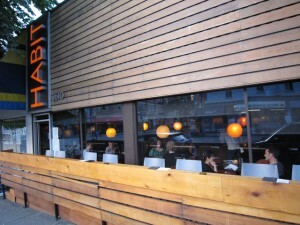 Check out Main Street’s funky Mexican hot spot, Murata, for its contemporary menu and live music. A self-declared “rec-lounge,” Habit is the place to go for a 1970s retro feel and modern tapas experience (2610 Main Street, Vancouver, 604-877-8582). Next door at The Cascade Room, Habit’s sister restaurant and lounge, drink up unique classic cocktails, including juleps, toddies, and frappes (2616 Main Street; 604.709.8650). For those looking for a less “traditional” brunch, Sun Sui Wah Seafood Restaurant is a large Cantonese restaurant popular for its Dim Sum (steamed dumpling brunch), as well as its fresh seafood dishes (3888 Main Street; Vancouver 604-872-8822). Some people argue that Sun Sui Wah is Vancouver’s best Chinese restaurant. You will be impressed with the staff, service and food. Shoppers keen to avoid cookie-cutter fashion will be pleasantly surprised to find an array of boutiques located along South Main Street. Twigg&Hottie showcases independent Canadian designers and sustainable wear for both sexes (3671 Main Street; Vancouver, 604-879-8595). Vancouver’s Barefoot Contessa is a whimsical must-see boutique for women. Flirty but elegant, The Barefoot Contessa also sells items such as French soaps, retro linens, and vintage pieces (3715 Main Street; Vancouver, 604-879-1137). At Bodacious, a woman’s curves are celebrated. Featuring several local designers with an emphasis on clothing for the voluptuous body, Bodacious is famous for its signature wrap dress, which is updated every season (4393 Main Street; Vancouver, BC, 604-874-2811).